7:30pm – 11:45pm | FREE! 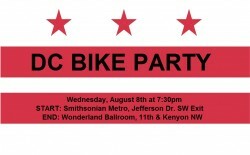 The DC Bike Party is a once monthly party ride around the Nation’s Capitol. It’s free, and it’s open to everyone. Our next ride is on August 8th. We’ll meet at 7:30pm at the Smithsonian Metro (Jefferson Dr exit), pitstop at 51st State (2512 L St NW), and end at The Wonderland Ballroom (11th & Kenyon NW). Bikesharers are welcome, too! We have a designated Capital Bikeshare coordinator who will guide you to docking stations.